What can make it more fun to get back to work? When the workspace you have is furnished exactly to your tastes. Whether you’re a color-loving dealmaker or minimalist mogul, the following office furniture selections will make you eager to get back down to business. Oh, the dreaded end of summer. Most of us grew up eyeing September as the finale to freedom, and as adults it certainly marks a return to indoor life. But getting your nose back to that grindstone doesn’t have to stink. 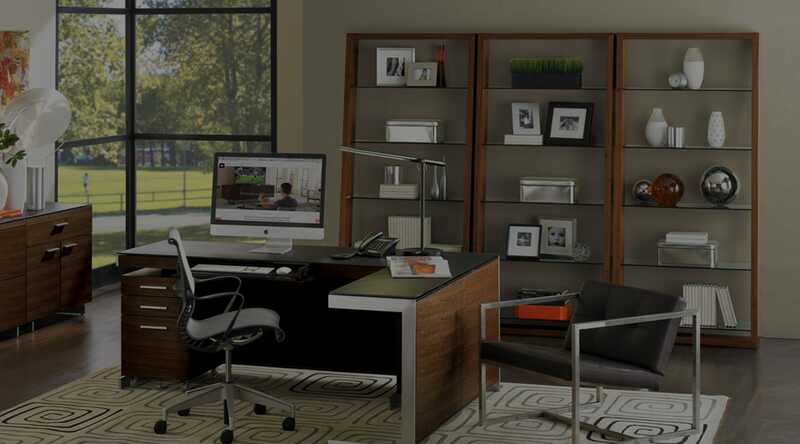 A personalized and beautiful office space can help you shake that perpetual case of the Mondays. Here are five chic if wildly different styles that may help inspire you to get back to work. If your vibe is mid-century, the office is the perfect place to showcase your favorite era. Wood veneers, sleek lines and functional comfort abound in this popular look, as seen in the fluid lines of the Buttercup Swivel Chair and charming Grasshopper Table Lamp. Include a bar cart like this swanky iteration by Jonathan Adler to channel your inner Don Draper and mix up that 5 o’clock martini. For the big boss, things just seem to get done better when everything is top of the line. If it seems anathema to enjoy a luxurious workspace, that may be a sign this much decadence is above your pay grade. Kidding, of course. Everyone deserves to feel like an elite exec while bringing home the bacon. Luscious finishes and materials make you feel large and in charge. If a spot of color is what moves you, why not deck out the space where you work with what makes you happiest? To keep your colorful office from turning kaleidoscopic, pair your bright-hued pieces with a neutral or even plain white space. This lets your joy take center stage while still allowing for a bit of visual respite when you need it. For additional inspiration, employ Kartell’s Componibili containers for storage in lieu of a traditional credenza. They go beautifully with an iconic design like a cheery George Nelson clock. Whether you work from home or just dearly wish you could, your office can give you that homey vibe with the right decorating choices. Bring a few personal items in like a select tchotchke or family photo and display them alongside your awards and business manuals on an angled bookshelf. A comfy rug underfoot eases you into the work day, and this traditional desk hides your bare feet. Finally, if you can't let anything distract you from your next brilliant idea, go minimalist. Super clean lines and graphic elements let you focus while simultaneously inspiring you to streamline your own processes. Use a monochromatic color scheme for a cool, ultramodern vibe. Black turtleneck not included.